They also eliminate "Bulb Out" warnings or "Bulb Failure Warning"in your dash. This Warning Canceller HID Capacitor is needed in order to properly install the kit as it removes the warning and headlight flicker. Easy Installation: Simply connect the power supply to your ballast through this cable. What's Included: 2 x HID Warning Canceller Capacitors. 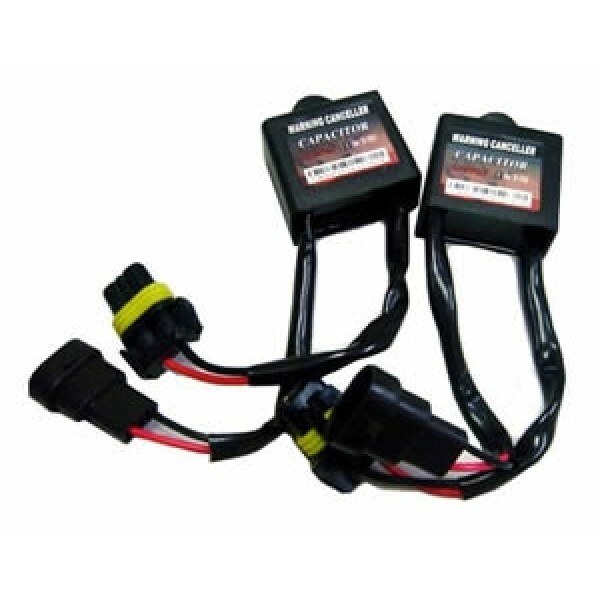 These HID Error Code & Anti Flicker Capacitors are used when you're experiencing issues with your aftermarket HID Kit. The two most common issues these capacitors resolve are light flickering (strobe effect) and "Bulb Out" indicator lights in dash. Flickering Issue: The flickering problem happens when your vehicle's computer notices that the bulb has been changed and is no longer the original bulb. It continuously sends a pulse to the lights trying to light the bulb and that bit of power gives a strobing or flashing to the headlights. Bulb Out Issue: Many newer cars have an indicator light to warn the driver if one of the headlights has burnt out. Since HID Kits run on a lower wattage then normal Halogen bulbs, your car thinks the headlight has burnt. This will give you a "Bulb Out" indicator light in your dash. This usually does not affect the lights functioning but can be rather annoying. The warning canceller fixes this issue and removes all warning lights.